Spermatogonial stem cell transplantation (SSCT) could become a fertility restoration tool for childhood cancer survivors. However, since in mice, the colonization efficiency of transplanted spermatogonial stem cells (SSCs) is only 12%, the efficiency of the procedure needs to be improved before clinical implementation is possible. Co-transplantation of mesenchymal stem cells (MSCs) might increase colonization efficiency of SSCs by restoring the SSC niche after gonadotoxic treatment. 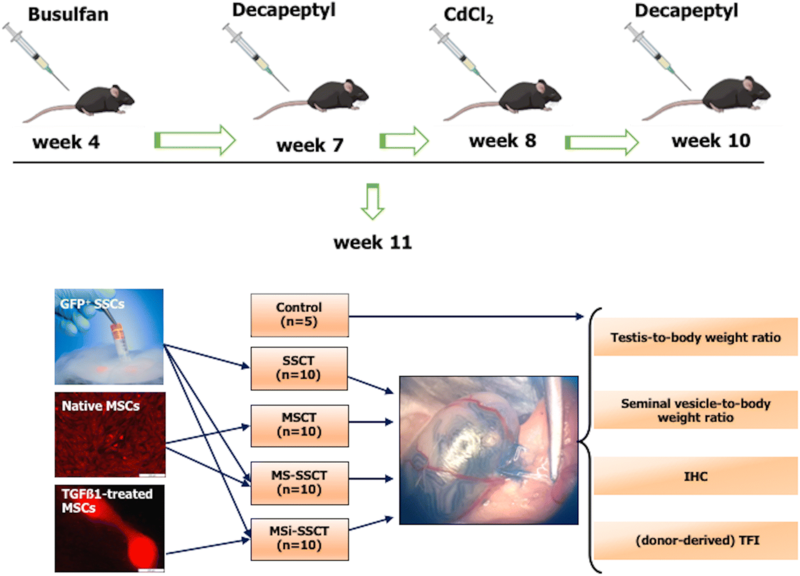 A mouse model for long-term infertility was developed and used to transplant SSCs (SSCT, n = 10), MSCs (MSCT, n = 10), a combination of SSCs and MSCs (MS-SSCT, n = 10), or a combination of SSCs and TGFß1-treated MSCs (MSi-SSCT, n = 10). The best model for transplantation was obtained after intraperitoneal injection of busulfan (40 mg/kg body weight) at 4 weeks followed by CdCl2 (2 mg/kg body weight) at 8 weeks of age and transplantation at 11 weeks of age. Three months after transplantation, spermatogenesis resumed with a significantly better tubular fertility index (TFI) in all transplanted groups compared to non-transplanted controls (P < 0.001). TFI after MSi-SSCT (83.3 ± 19.5%) was significantly higher compared to MS-SSCT (71.5 ± 21.7%, P = 0.036) but did not differ statistically compared to SSCT (78.2 ± 12.5%). In contrast, TFI after MSCT (50.2 ± 22.5%) was significantly lower compared to SSCT (P < 0.001). Interestingly, donor-derived TFI was found to be significantly improved after MSi-SSCT (18.8 ± 8.0%) compared to SSCT (1.9 ± 1.1%; P < 0.001), MSCT (0.0 ± 0.0%; P < 0.001), and MS-SSCT (3.4 ± 1.9%; P < 0.001). While analyses showed that both native and TGFß1-treated MSCs maintained characteristics of MSCs, the latter showed less migratory characteristics and was not detected in other organs. Co-transplanting SSCs and TGFß1-treated MSCs significantly improves the recovery of endogenous SSCs and increases the homing efficiency of transplanted SSCs. This procedure could become an efficient method to treat infertility in a clinical setup, once the safety of the technique has been proven. Advanced cancer treatments have resulted in more than 80% survival rate of childhood cancer patients [1, 2]. However, a childhood cancer survivor study reported that 46% of these patients would become infertile, while 18% of their siblings will experience fertility problems in adulthood . As these boys lack active spermatogenesis at the time of cancer diagnosis, they cannot benefit from sperm freezing. Testicular tissue banking in combination with spermatogonial stem cell transplantation (SSCT) has been proposed as a possible fertility preservation strategy for these patients [4, 5]. However, this procedure shows a low homing efficiency of SSCs  and a deficient epigenetic reprogramming after SSCT , which could be attributed to the damaged supportive microenvironment. Substantial evidence shows that both chemo- and radiotherapy affect not only the SSCs but also the niche cells (Sertoli, Leydig, and peritubular cells) [8–10]. Transplanting only SSCs might thus be inefficient to restore fertility after gonadotoxic treatment. To improve the efficiency of the procedure, co-transplantation of supporting cells or factors may be considered. Mesenchymal stem cells (MSCs) are multipotent adult stem cells with proven regenerative potential residing in all organs of the body . Paracrine growth factors secreted by MSCs have shown anti-apoptotic, anti-inflammatory, and anti-oxidative properties [12, 13]. Co-transplantation of cardiac stem cells and MSCs has shown highly promising results in the cell therapy for myocardial infarction and chronic heart failure . Also, in the treatment of diabetes, co-transplantation of islets of Langerhans with MSCs showed better remodeling, structural organization, and revascularization compared to islets transplanted alone . Moreover, hyperglycemia was reverted to normal in 92% of mice co-transplanted with MSCs compared with 42% of those transplanted with islets alone. Thus, co-transplantation improves not only the structural organization but also the organ functionality . MSC-based cell and gene therapies have already been successful in both pre-clinical and clinical studies for the treatment of disorders in visceral organs (heart, liver, kidney, lung, and pancreas), the musculoskeletal system, and the nervous system (for review: ). The benefit of transplanting SSCs together with MSCs has been hypothesized  but not yet investigated. Nevertheless, in various animal models, MSCs from different sources (bone marrow, adipose tissue, and umbilical cord) have been transplanted as an alternative to SSCs. However, this was not very successful. MSCs did not transdifferentiate towards germ cells and, therefore, spermatogenesis could not be restored. However, importantly, endogenous spermatogenesis was re-established in all experiments [18–22]. This regenerative potential might be the effect of paracrine factors secreted by the transplanted MSCs. In vitro induction of bone marrow MSCs from ram with TGFβ1 for 21 days resulted in the upregulation of the germ cell-specific genes DDX4, PIWIL2, ITGb1, OCT4, and DAZL. These TGFβ1-treated MSCs were found to survive, home, and form colonies after transplantation into ram testes and also expressed the germ cell marker PGP9.5/UCHL1. Although MSC-derived spermatogenesis was not achieved, recovery of endogenous spermatogenesis was reported . 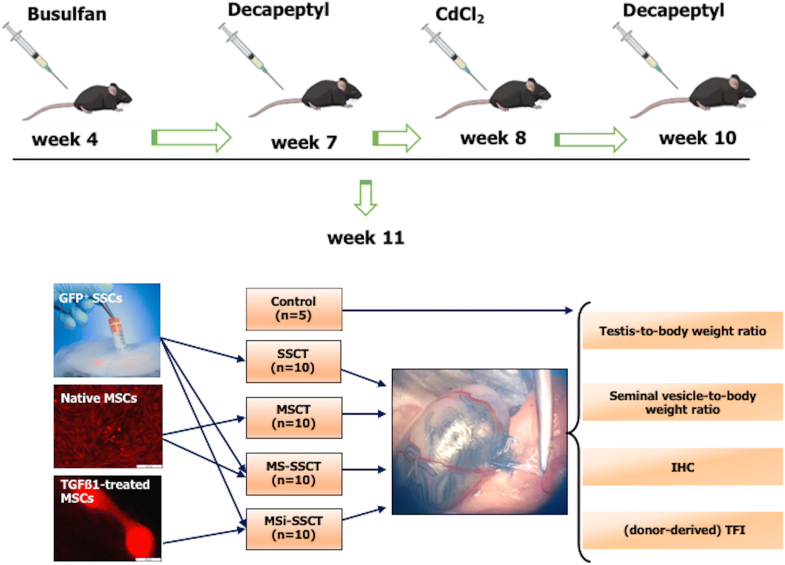 We hypothesize that co-transplanting MSCs along with SSCs might improve SSCT efficiency by restoring the testicular niche. To investigate the regenerative potential of MSCs, we optimized an infertility model representing the impaired somatic environment. Next, we co-transplanted SSCs with either native MSCs or TGFβ1-treated MSCs and compared this with the transplantation of only SSCs or MSCs. Three-week-old C57BL/6J mice were purchased from Charles River Laboratories, Paris, France, and used as recipients. In order to deplete endogenous spermatogenesis, mice (n = 46) were given busulfan intraperitoneally at a dose of 40 mg/kg body weight at 4 weeks of age. 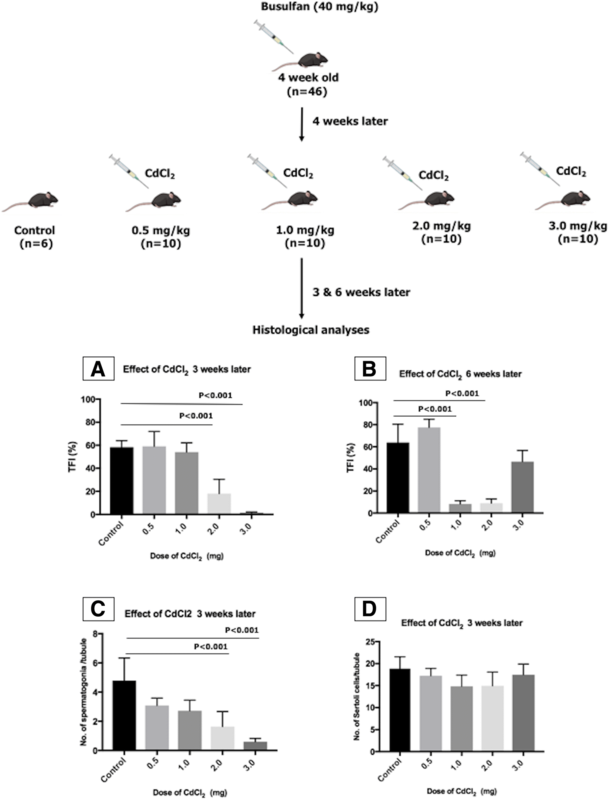 To ensure the depletion of Sertoli cell function, 4 weeks later, cadmium chloride (CdCl2), which has been shown to induce apoptosis of Sertoli cells in vitro , was administered at different doses (0.5, 1.0, 2.0, and 3.0 mg/kg body; n = 10 in each group). Six mice treated only with busulfan were used as control (Fig. 1). Three weeks after CdCl2 injections, half of the mice from each group were sacrificed by cervical dislocation, while the other half was sacrificed after 6 weeks. Their testes were collected in Dulbecco’s modified Eagle’s medium/F12 (DMEM/F12; 31330-038; Invitrogen, Merelbeke, Belgium). The tunica albuginea was removed, and the testicular tissue was fixed in acidified formol alcohol fixative (10056710; Labonord, Rekkem, Belgium) for at least 1 h. The tissue was placed overnight in a vacuum infiltration processor bath (Bayer, Diegem, Belgium) and embedded in paraffin the next morning. From each testis, 5-μm-thick serial sections were cut with a microtome (SM2010R; Leica, Brussels, Belgium). Serial cross sections at three different depths (at least 100 μm shift) were blindly analyzed. Histological evaluations were done with hematoxylin and eosin (HE) to assess the overall tubular fertility index (TFI; percentage of tubules containing spermatogenesis). Seminiferous tubules were analyzed by immunofluorescence staining by assessing the number of spermatogonia (UCHL1+) and Sertoli (SOX9+) cells per round tubule (Additional file 1 and Additional file 2: Figure S1C–D). A tubule was considered to be round if the ratio between the longest diameter of the tubule and the diameter perpendicular to it was less than 1.5. Red fluorescent protein (RFP)-transfected C57BL/6 mouse bone marrow MSCs (MUBMX-01201; Cyagen Biosciences, CA, USA) were cultured in T25 cell culture flasks (690175; Greiner Bio-One Vilvoorde, Belgium) at the density of 1 × 106 cells/flask with and without 10 ng/ml TGFβ1 (P04202; R&D Systems, Minneapolis, USA) in OriCell™ mouse MSC basal medium (MUXMX-90011; Cyagen Biosciences, CA, USA) in a humidified incubator with 5% CO2 at 37 °C for 15 to 21 days (Fig. 2A, B, Additional file 3). The medium was changed every third day, and cells were passaged after reaching 80% confluency. For transplantation experiments, cells were used at passages 5 or 6. Antibody arrays targeting 96 mouse cytokines (ab193659; Abcam, Cambridge, UK) were used to identify and quantify paracrine factors secreted at the end of the culture in order to compare cytokine production in native MSCs and TGFß1-treated MSCs (Additional file 4: Figure S3 and Additional file 5: Table S1). The culture medium of four biological replicates was collected and subjected to the antibody array assay as per the manufacturer’s instructions. Chemiluminescence was detected with a ChemiDocTM MP Imaging System (Bio-rad). Densitometry was performed using Bio-Rad’s Image Lab v.5.2.1 software. Relative levels of secretion were calculated as the average of the sum of signal intensities for each marker of interest minus the average of the sum of the signal intensities of the corresponding blank control spots. Normalization was performed by defining one array as the reference to which the other arrays were normalized from the average of the sum of the signal intensities belonging to the positive control spots. After that, for each target, the average of the sum of the signal intensities of the corresponding medium control was subtracted. We followed very rigorous inclusion criteria, and only cytokines with signal intensities above 15,000 in all four biological replicates following this correction were considered. Finally, the secretion levels observed in cultured MSCs were compared with those of TGFß1-treated MSCs. Pre-pubertal GFP+ F1-hybrid pups (5–7 days), obtained by crossing male inbred C57BL with female inbred SV129 green fluorescent protein (GFP) in the VUB animal facility, were used as donors. Testicular cells were isolated from 20 donor testes, pooled and cryopreserved at a concentration of 1–2 × 106 cells/ml using a slow freezing protocol . Concentration and viability of the cell suspensions were assessed with a Tali® image-based cytometer (T10796; Life Technologies, Gent, Belgium) after fresh cell isolation and after freeze-thawing. Based on the results from the optimization study, recipient mice (n = 45) were prepared for transplantation by injecting busulfan (40 mg/kg) and CdCl2 (2 mg/kg) intraperitoneally. Mice were injected twice (1 week before CdCl2 injection and 1 week before transplantation) with a subcutaneous dose of the GnRH agonist Decapeptyl (4.26 mg/kg; 0.1 mg; Ipsen, Paris, France) to improve homing and colonization of transplanted cells  (Fig. 3). Transplantations were performed under a stereomicroscope as previously described . Mice were anesthetized with a mixture of an intraperitoneal injection (150–200 μl) of 75 mg/kg ketamine (Ketamidor®; Ecuphar, Oostkamp, Belgium) and 1.0 mg/kg medetomidine (Medetor®; Virbac Animal Health, Burgdorf, Germany). A subcutaneous dose (50 μl, 5 mg/kg body weight) of the analgesic meloxicam (Metacam®; Boehringer Ingelheim, Vetmedica GmbH, Ingelheim am Rhein, Germany) was administrated pre-operatively and for 2 days post-operatively. The surgical area was prepared by clipping abdominal hair and disinfected with cedium chlorhexidini alcoholicus 0.5% (BE351513; Laboratoires Gifrer Barbezat, France). The abdomen was incised, and the testes were exteriorized. After thawing and assessing concentration and viability (with a Tali® image-based cytometer (T10796; Life Technologies, Gent, Belgium), GFP+ donor cells were resuspended in injection medium [(DMEM/F12, 10% penicillin/streptomycin (15140-122; Life Technologies, Merelbeke, Belgium) containing 4% fetal calf serum (10500-056; FCS, Life Technologies)] to obtain a concentration of 10–20 × 106 cells/ml. The experiment consisted of four different transplantation groups and one control group. The first transplantation group (n = 10) received SSCs (SSCT). The second group (n = 10) received MSCs (MSCT). The third group (n = 10) received both SSCs and MSCs (MS-SSCT), and the fourth group (n = 10) received SSCs and TGFß1-treated MSCs (MSi-SSCT). Ten microliters or 2 × 105 cells were injected per testis. For groups 3 and 4, the two cell types were mixed in 1:1 volume (SSCs/MSCs or SSCs/TGFß1-treated MSCs), keeping the total cell concentration constant. Immediately after transplantation, mice received a subcutaneous dose of 5 mg/kg (50 μl) of enrofloxacin (Baytril®; Bayer, Diegem, Belgium). The control group (n = 5) was treated with busulfan, CdCl2, and Decapeptyl but did not undergo transplantation (Fig. 3). Three months after transplantation, 30 serial cross sections per testis (with a 100 μm shift between each slide) were blindly analyzed to assess the overall TFI (percent of tubules containing spermatogenesis) and the donor-derived TFI (percent of tubules containing donor-derived spermatogenesis) . Double immunofluorescent staining was performed for RFP (MSCs) and MVH (Germ cell), SOX9 (Sertoli cell), or STAR (Leydig cell) to evaluate the expression of testicular cell markers by transplanted MSCs (Additional file 1 and Additional file 6). Statistical analysis was done using the software package SPSS (IBM, SPSS Statistics Version 25, IBM Corporation, Somers, NY, USA). All data are presented as means ± standard deviation (SD). A one-way analysis of variance (ANOVA) was used in order to find differences between different doses or treatments. A post hoc test with Bonferroni correction was used in order to find pairwise significant differences. Normality of the data was verified using the Kolmogorov-Smirnov test. When normality of the data did not hold, the Kruskal-Wallis test was used as an alternative to the ANOVA test. A difference between the level of cytokines (mean pixel densities) was analyzed using the Holm-Šídák multiple comparison tests for comparing the treated with the non-treated MSCs. P values < 0.05 are considered statistically significant. Graphs were prepared using GraphPad Prism 5 (GraphPad Software, Inc., La Jolla, CA). Because endogenous spermatogenesis recovers rather quickly in the generally used transplantation model, we aimed to create a mouse model which better represented the clinical condition (no recovery of endogenous spermatogenesis) by damaging the SSC niche. More than 80% of the tubules were without spermatogenesis after 3 weeks in the groups that received 2 or 3 mg/kg CdCl2 (Fig. 1A). However, after 6 weeks, the regeneration of spermatogenesis was observed for the 3 mg CdCl2 group (Fig. 1B). Moreover, severe degeneration and atrophy of seminiferous tubules were evident in both 2 and 3 mg CdCl2 groups (Additional file 2: Figure S1A-B). Immunofluorescent staining for UCHL1 showed a decrease in the number of spermatogonia per seminiferous tubule with increasing dose of CdCl2 (Fig. 1 and Additional file 2: Figure S1C). However, immunofluorescent staining for SOX9 showed that the number of Sertoli cells per seminiferous tubule was unaffected (Fig. 1D and Additional file 2: Figure S1D). Both 2 and 3 mg/kg CdCl2 cleared 80% of the tubules from germ cells. But since two mice died in the 3 mg/kg CdCl2 group, the lower dose of 2 mg/kg CdCl2 was used for the transplantation experiments. When cultured in vitro, MSCs showed a long spindle-shaped and fibroblast-like morphology (Fig. 2A and A′). However, occasionally, TGFβ1-treated MSCs also showed spheroid-like colonies at 15–21 days of culture (Fig. 2B and B′). After 3 weeks in culture, cells still showed RFP expression and expressed the MSC markers CD44, SCA1, and CD29, but were negative for CD45 (Fig. 2C–F, Additional file 3: Figure S2 E–H). The expression pattern of these markers remained the same throughout the culture period in both the control and TGFβ1-treated condition. The antibody array showed that 24 out of 96 cytokines were detected in both the TGFß1-treated and non-treated group. TGFß1 treatment resulted in significantly lower expression of IL6 (P < 0.001), MCP1 (P < 0.001), MMP3 (P < 0.001), TCK1 (P = 0.001), KC (P < 0.001), and MIP1G (P = 0.006) compared to non-treated MSCs (Fig. 2G, Additional file 4: Figure S3, Additional file 5: Table S1). Three months after transplantation (Fig. 3), mice were sacrificed and the testes were collected. In the MSCT group, three mice died shortly after the transplantation. A significant increase of testis size and testis-to-body weight ratio was found in transplanted groups compared to controls (Fig. 4a, b) (control vs. SSCT: P = 0.012; control vs. MS-SSCT: P = 0.004; control vs. MSi-SSCT: P < 0.001). However, no difference was observed for the seminal vesicle-to-body weight ratio (Fig. 4c). Resumption of spermatogenesis was found to be significantly improved in all transplanted groups compared to controls (P < 0.001). TFI did not differ significantly between SSCT and MS-SSCT, nor with MSi-SSCT. However, interestingly, a significantly lower TFI was seen in MSCT compared to SSCT (P < 0.001) (Fig. 4d, e). MSi-SSCT was significantly better when compared to MS-SSCT (P = 0.036). Overall, SSCT and MSi-SSCT gave the best results. 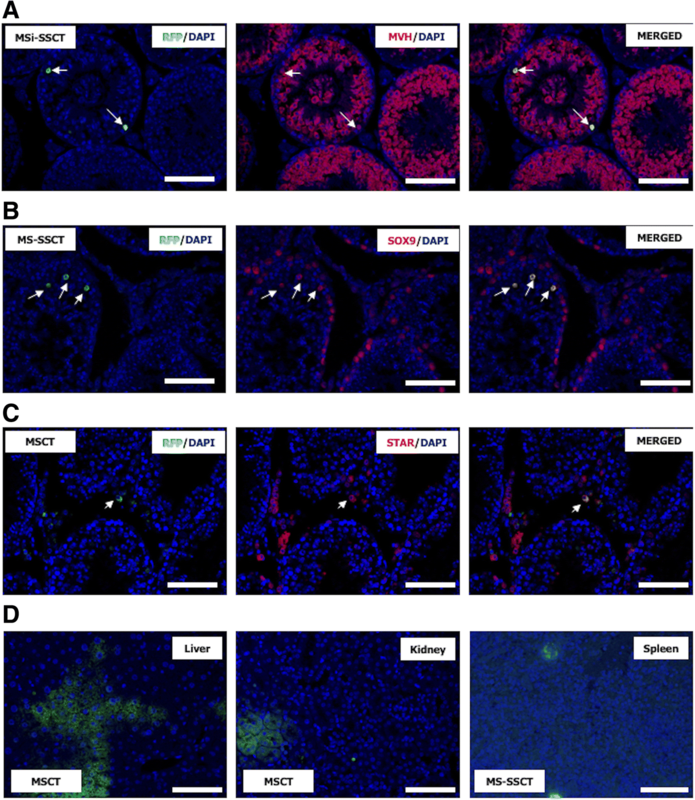 Donor-derived spermatogenesis was confirmed with immunohistochemistry for GFP (Fig. 4f). Donor-derived spermatogenesis was found in 21.4% of the successfully injected testes after SSCT, in 0% after MSCT, in 12.5% after MS-SSCT, and in 50.0% after MSi-SSCT. The donor-derived TFI was found to be significantly higher in the MSi-SSCT group (18.8 ± 8.0%) compared to the SSCT (1.9 ± 1.1%; P < 0.001), MSCT (0.0 ± 0.0%; P < 0.001), and MS-SSCT (3.4 ± 1.9%; P < 0.001) group (Fig. 4g). Transplanted MSCs expressed the germ cell marker MVH (Fig. 5a). The percentage of tubules with MVH+ MSCs after MS-SSCT (51.0 ± 24.6%) and MSi-SSCT (51.3 ± 23.2%) was found to be significantly higher compared to MSCT (24.6 ± 9.6%; P < 0.001). Very rarely, some tubules showed cells expressing the Sertoli cell marker SOX9 after MSCT and MS-SSCT (Fig. 5b). The Leydig cell marker STAR was found to be co-expressed with RFP (Fig. 5c) in the case of failed transplantations (interstitial injection). In the MSi-SSCT group, MSCs showed MVH expression, but none expressed SOX9 or STAR. MSCs were also found to have migrated to the visceral organs (liver, kidney, and spleen) after MSCT and MS-SSCT (Fig. 5d) but not after MSi-SSCT. In human, chemo- and/or radiotherapy not only deplete SSCs but might also affect the niche cells . Busulfan has been the drug of choice to prepare recipient mice for SSCT. Busulfan treatment destroys spermatogenesis by damaging the germ cells and Sertoli cells [29, 30]. However, doses lower than 40 mg/kg are found to be inconsistent as this did not result in prolonged depletion of germ cells  but usually result in a resumption of endogenous spermatogenesis. Alternatively, low doses of bi-lateral intra-testicular busulfan injections resulted in the better outcome and minimization of the risk of systemic toxicity . Busulfan treatment followed by intratubular injection of cadmium sulfate completely destroyed the Sertoli cells but manifested inflammatory reaction increasing cellular debris . Since CdCl2 affects not only the SSCs but also the Sertoli and Leydig cells [9, 24], we chose to use both busulfan and CdCl2 but through intraperitoneal route to deplete SSCs and their niche cells in order to better mimic the clinical situation. Although CdCl2 did not have an effect on the number of Sertoli cells, their function might have been impaired, as spermatogenic recovery was rarely seen (5% TFI; Fig. 4e). Our results showed that transplanted MSCs started to co-express the germ cell marker MVH or the Sertoli cell marker SOX9. However, MSC-derived complete spermatogenesis was never observed. These results are in line with those obtained by Ghasemzadeh-Hasankolaei et al. in 2016. In ram, TGFß1-treated bone marrow MSCs expressed germline-specific genes and were able to survive, home, and form colonies in the testes after transplantation. Although differentiation towards mature spermatozoa could not be proven, these results confirm its critical regulatory role during spermatogenesis . A similar observation was reported recently when treating acute muscle injury in mice with autologous transplantation of adipose tissue-derived MSCs . Muscle regeneration was improved, but the direct differentiation of MSCs was never observed. The regenerative potential was attributed to paracrine factors secreted by MSCs . Donor-derived spermatogenesis was found in 21.4% of successfully injected testes after SSCT which was significantly improved after MSi-SSCT (50%) but is low compared to our previous study (75%) . The latter could be explained by the aggressive recipient preparation (busulfan and CdCl2) leading to a more severely damaged SSC niche. But, interestingly, we could achieve up to 19% of donor-derived TFI after MSi-SSCT, while this was only 2% in the SSCT group (9% in our previous study ). Moreover, in all transplanted groups, endogenous spermatogenesis was restored which proves the regenerative potential of MSCs and their supportive role in re-establishing the SSC niche. After transplantation, the testicular size and testis-to-body weight ratio were improved, showing the recovery from the toxic treatment. The seminal vesicle-to-body weight ratio did not change, which indicates a normal testosterone level . Spermatogenic recovery did not differ between SSCT and MSi-SSCT. However, when only donor-derived spermatogenesis is taken into account, co-transplanting SSCs with MSCs almost doubled the SSCT efficiency (TFI 1.94% vs. 3.44%). Although complete trans-differentiation of MSCs towards spermatozoa was never observed, 50% of the tubules showed MVH+ MSCs after MS-SSCT and MSi-SSCT. Thus, the higher donor-derived TFI could be attributed to better homing and proliferation of SSCs due to the paracrine factors secreted by MSCs. Indeed, MSCs secrete factors that play a role in cell survival, immunomodulation, cell migration, angiogenesis, proliferation, and antioxidation [12, 13]. Stimulating effects on the niche cells and remaining endogenous SSCs could explain why transplanting MSCs alone also resulted in a better spermatogenic recovery compared to non-transplanted controls. In female mice, co-transplanting ovarian tissue and MSCs could restore fertility after chemotherapy. The use of adipose tissue-derived MSCs showed a better vascularization in the xenografted human ovarian tissue resulting in improved follicular survival, growth, and tissue oxygenation while reducing apoptosis . Most importantly, the highest TFI (19%) was observed after co-transplanting SSCs with TGFß1-treated MSCs. 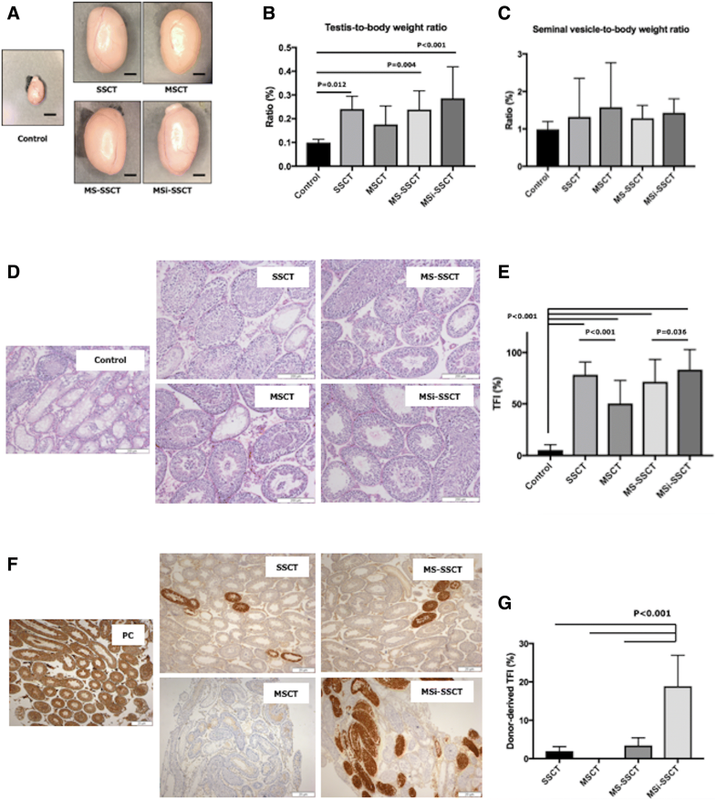 TGFß1 treatment might have stimulated the MSCs to preferentially home to the testis (and less to other organs) to enhance SSC homing and proliferation and contribute to the regeneration of the damaged niche. As busulfan and CdCl2 may affect the function of other organs as well [9, 38] and MSCs migrate to sites of injury through the lymphatic circulation , transplanted MSCs could be detected in the liver, kidney, and spleen after MSCT and MS-SSCT. The migratory property of MSCs makes them an ideal candidate for regenerative therapies, but the challenge is to deliver them at the expected site. SSCs do not show this migratory property. Interestingly, also in the MSi-SSCT group, we did not find transplanted MSCs in organs other than the testes. Antibody array data gave some insight on the molecular mechanisms of TGFß1 treatment. TGFß1 treatment resulted in significantly lower expression of IL6, MCP1, MMP3, TCK1, KC, and MIP1G which have been previously reported to play a role in inflammation and migration [40–43]. Inhibition of these paracrine factors by TGFß1 might have resulted in MSCs that lost their migratory property and remained in the testis which might have further contributed to restoring the SSC niche, resulting in a higher donor-derived TFI. Tracking the cells in real-time by using time-lapse systems on living animals would provide more insight into SSC homing and MSC migration. The processes of MSC migration have been studied before by using advanced imaging techniques like bioluminescence  and PET-CT scan . Co-transplantation of SSCs together with TGFß1-treated MSCs improves fertility restoration efficiency in mice, probably because TGFß1 treatment preferentially directs MSCs to the testis where their secretion factors restore the testicular niche. Although more pre-clinical studies are necessary to gain more insight into the mechanism, MSi-SSCT has the potential to become a clinical application in the field of fertility preservation, once the reproductive safety has been proven. The authors would like to thank Mr. Pierre Hilven and Mr. Fabian Van Haelst for taking care of the laboratory animals, Mr. Steven Branson for his technical assistance with the antibody array, and MSc. Jaime Onofre for the help with immunohistochemistry. The authors are thankful to the Indian Council of Agricultural Research (ICAR), New Delhi, for the ICAR - International Fellowship granted to P. Kadam and the financial support from the Vrije Universiteit Brussel and the Innovative Training Networks (ITN) under the People Programme of the European Union Seventh Framework Programme (EU-FP7-PEOPLE-2013-ITN 603568) to E. Goossens. E. Ntemou was supported by the Scientific Fund Willy Gepts. Y. Baert and D. Van Saen are postdoctoral fellows of the Fonds Wetenschappelijk Onderzoek (FWO). PK was involved in the conception and design of the study; performed the experiments, the acquisition of data, and the analysis and interpretation of data; drafted the article; and critically proofed the final manuscript. EN was involved in the acquisition of data and critically proofed the final manuscript. YB was involved in the antibody array analysis and interpretation of data, revised the article, and critically proofed the final manuscript. DVS was involved in the conception and design of the study, the analysis and interpretation of data, and the revision of the article and critically proofed the final manuscript. SVL was involved in the data analysis. EG was involved in the conception and design of the study, analysis and interpretation of data, and revision of the article and critically proofed the final manuscript. All authors read and approved the final manuscript. All procedures performed on the animals were in accordance with the ethical standards of the Federation for Laboratory Animal Science Associations guidelines and approved by the Institutional Animal Care and Use Committee of the Vrije Universiteit Brussel (VUB) Brussels, Belgium (14-216-2 and 16-216-3). Consent to participate is not applicable.